Ok Ok - I know we should be both encouraged and encouraging breastfeeding in public, but lets face it, most of us don't have the balls to do it! Even with a blanket to cover me, I risk exposure! I have a very wriggly 9 week old baby who I end up wrestling and repositioning in every feed. I'd be mortified if this event was witnessed by the public - especially when said public are the people of the town in which I live! I found it hard enough to breastfeed in the doctor's waiting room when waiting for baby clinic! In The Glades shopping centre there is breastfeeding area in the baby change room on the lower shops level near the pet shop and Rush hair salon. As pictured. 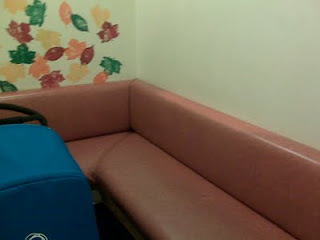 It's got a long slightly padded bench and room for your pram, however this area is very busy and noisy. There is also a toilet cubicle here which is supposed to be big enough for your pram too - I found it to be a tight squeeze. This breastfeeding area is clean but looks a little grubby as you can see where the padded seat has been the victim of school girls apparently in love and armed with marker pens! There is another breastfeeding area on the 2nd floor car park level but to get to it you need to take the smaller central lifts near optical express and faith shoes. This is also a mother's only area inside the baby change room - this is much quieter than the lower shops room and also seems much cleaner too. It may just be the time of the year, but I did find this room to be hot! There are two wooden benches to chose from and room for your pram. Situated close to the baby change room is the ladies toilets - inside the ladies toilets is a row of large cubicles which have plenty of room for a pram too. There is also a vending machine outside the baby change room for if you need a drink! There is also a breastfeeding area inside Marks and Spencers, if you were to go to where the toilets are on the upper level, if you walk past the entrance to the ladies room there is another room to the right which is only for baby change and breastfeeding (there is an extra baby change table in the main ladies toilets). I haven't used this room yet as there is only space for one nursing mum and it's always been in use when I have gone. The room is quiet and dimly lit. Outside The Glades a breastfeeding area is available in mothercare - please see my blog post on this. You may also be interested in my blog post about breastfeeding in Bluewater too.